I’m fascinated by conversion rates. Because you can boost your sales without spending a single penny on extra marketing. Rather than chasing new customers, you can tighten up your site, and get more out of your existing traffic. Wait, what are conversion rates? Simple, it’s every time your customer clicks the ‘buy button’. Or every time they sign up to your service. Your conversion rate is the percentage of total visitors that click that all-important button. Let’s cut to the chase and show you how to send your e-commerce conversion rate sky high. Did you know that 90% of your store visitors aren’t ready to buy from you yet? It takes a while to build up that trust, and convince someone to buy from you. But, rather than saying goodbye to that 96%, set up some smaller conversions along the way – like an email signup. Even if you don’t make the sale immediately, you’ll get an email address. That means you can nurture them. and make that big conversion later. 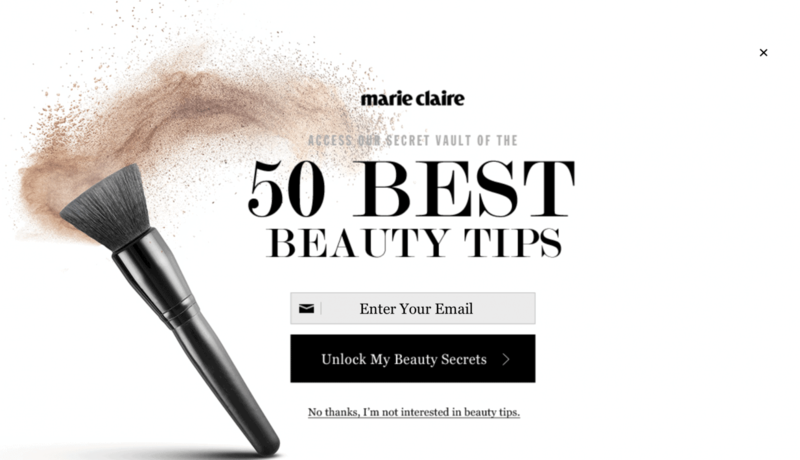 Take a look at how Marie Clare offer you their ‘50 Best Beauty Tips’ in exchange for an email address. They know their potential customers will love it, and they make a small conversion. Eventually, that subscriber will likely buy from them. Full conversion complete! Most people are sceptical about buying from a small business they’ve never heard of. Our cautious instinct kicks in, and we often talk ourselves out of it. So, take away these risks from the word ‘go’. Hugo Boss do this right at the very top of their website. Right away, they tell customers they can return the item for free. And, they’ll even make complementary alterations for you. If you don’t like the clothes, you get your money back, or you can have it changed. The risk and anxiety is gone. 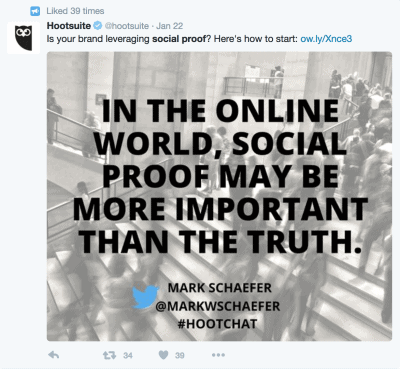 Another way to break down those cautious barriers and secure extra conversions is with social proof. Show your visitors that real people are already using your product. Customers are sheep; they like to know that other people trust your service! Asos do this better than anyone with their #AsSeenOnMe feature. 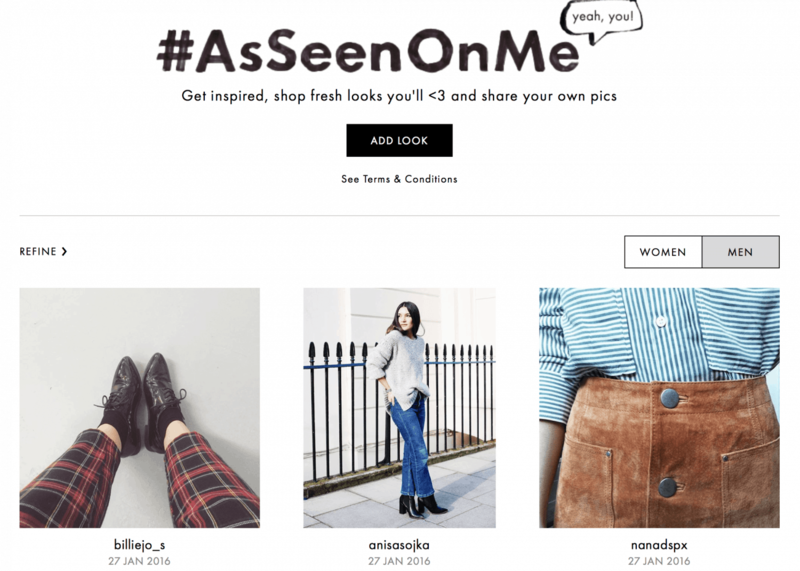 Customers upload pictures of them wearing Asos clothes. It convinces visitors that other people trust your products. And that gives them the confidence to click the ‘buy’ button. This particular feature also lets people see what the clothes look like on ‘normal’ people. (i.e. not a model!) Which goes a long way to helping people make their decision. 68%!! That’s a huge amount of people that are right at the finish line, but click away before buying. Why does this happen? One answer is a complicated checkout process. Customers get bored, frustrated or distracted. It’s your job to get them to check out fast. Simplifying the payment and checkout process is a top priority. 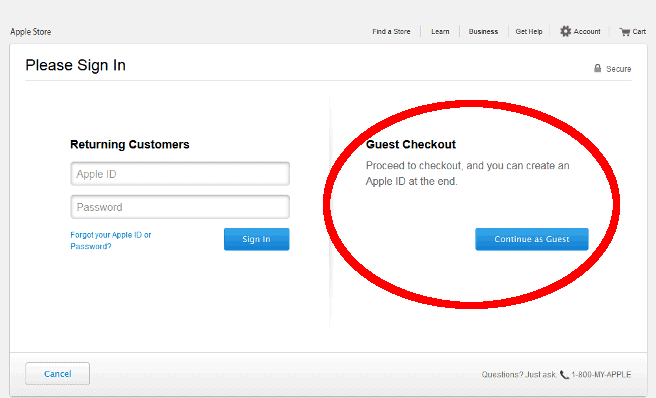 For existing customers who are already logged in, set up one-click-buying. 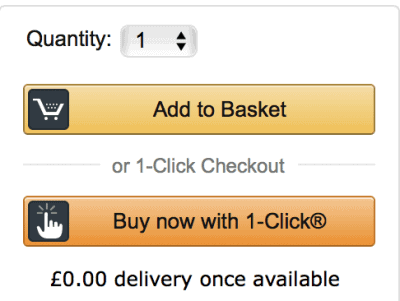 You already know that Amazon are the kings of one-click buying. You’ve probably fallen for it (I mean used it) already. The system remembers all your details, so you can order without going through the messy checkout process. There’s another reason why customers abandon their carts so frequently. Being asked for endless amounts of information. Remember, you’re trying to get as many conversions through the door as possible. Make this part as easy as possible. Give people a super easy way to pay, and move on. The more information you ask for, the more likely you are to lose the sale. Apple have a great system here. Of course, you end up putting your email address in eventually, but leave it right until the end. Get them to the payment gateway first. As a customer, we’ll often mentally commit ourselves to buying something. We’ll justify the price in our heads, and we’re finally going to the check out. And then – wait – they’ve just added $5 shipping! It’s a tiny amount, but it changes the entire psychology of buying. It’s another barrier that might just turn people away. Try adding free delivery to everything, and price the delivery cost into your products instead. We know this will make things a little tricky for you and your accounts, but there are ways to help you. Common sense tells us to sell as many products as possible. After all, everyone loves choice, right? The truth is actually quite different. When customers are faced with lots of products, they tend to choose none of them. They are overwhelmed, and can’t decide. When there are just a small selection of options, they find it easier to pick. Some Stanford University experts tested this in a jam shop. When they offered customers fewer choices of jam flavours, sales flew up. We’re all terrified of missing out on a fantastic deal or offer. If you tell customers you’ve only got a limited stock left, they’re much more likely to buy it. According to a recent study, this trick boosted one marketer’s conversion rate by an astonishing 332%. If you tell customers that an offer ends in 6 minutes and 18 seconds, they’re going to rush to the ‘buy’ button. And fast. This one is simple psychology. And it doesn’t necessarily have to be true either. But, it sure will boost your conversion rates. We hate to miss out on a great deal. The FOMO is real! A call-to-action is the single most important button on your website. It’s the ‘buy’ button or the ‘signup’ button. I particularly like the following example, which follows all three rules, and adds a little ‘clincher’ so take away any customer anxiety. It’s bright green, and it demands attention. There is plenty of clear space to draw the eye, and it has a sense of urgency; “Get Started”. But the best bit is that little clincher, “Join 1000s of men already signed up”. (I can even forgive the appalling use of the apostrophe). It incorporates social proof (like we talked about before), and it takes away that sense of risk or caution. Your value proposition is probably the most important factor in your conversion rates. It’s also the most difficult to get right. In my opinion, it’s one of the best value propositions on the web. A value prop is a combination of copy, images, and a CTA that captures your entire business in a split second. Let’s look at the example above. The combination of words and image are so deliciously simple, you instantly know what it does, and why you need it. And just look at that CTA: “Get your free card reader”. They should teach this in marketing school. If you can tell customers who you are and why they should buy from you in less than a second, your conversion rate is going to shoot through the roof. Customers are more likely to buy from you if they feel valued and understood. Anticipate what products they’ll like, and you convert them time and time again. We all know that Amazon are brilliant at this. They show you reels of personalised items based on your browsing history and past purchases. It builds trust, and strengthens the customer relationship. 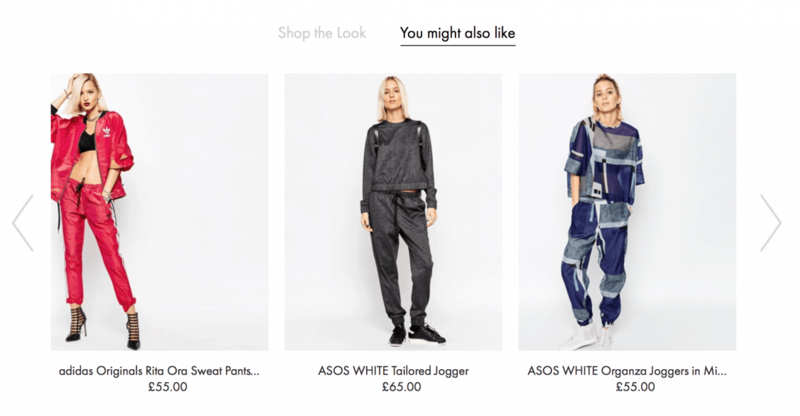 Asos also do this with a highlight reel called ‘You Might Also Like…” Based on your shopping history, they compile a list of related items and products. It feels personal, so customers are much more likely to hit the ‘buy’ button. If you’re using WooCommerce to power your store, you can use the ‘customer history’ extension to monitor customer purchases, and offer personalised suggestions. 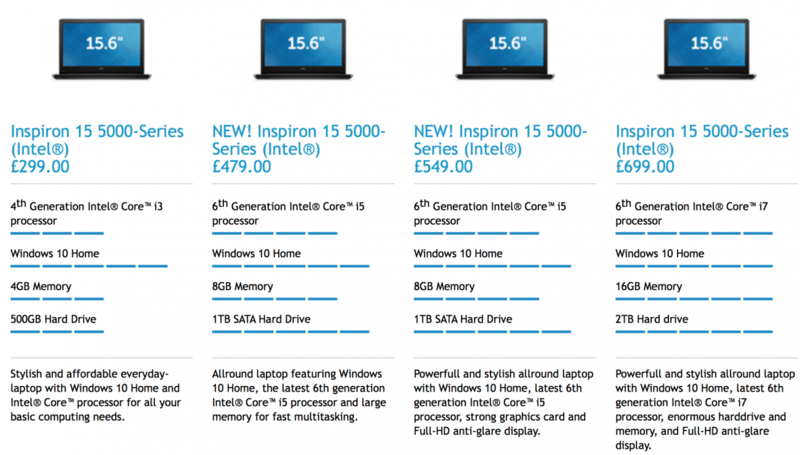 They are trying to sell the product by listing its functions and specs. Not a single statistic in sight. They’re not selling the information, they’re selling the benefits. They’re showing how their product will help you be more creative. It’s inspirational. (It’s also clean, simple, with a great value proposition). Stop describing your products, and start showing customers how it will change their life. Your website has just one single goal: to sell products. Anything else is just a distraction. Get rid of it. One of the hardest things for any entrepreneur to do is simplify their product, business, or website. Everything seems so essential, right? But, it’s time to be brave, and make cuts to the site. Here’s the website for Beats. They sell more headphones than any other company on the planet. You’ll notice that there is quite literally nothing to click on except the products themselves. There is nothing to distract you from the exploring further, and ultimately buying. The internet is designed for distraction. We get lost in rabbit holes and content. When it comes to your sales page, make sure there’s only one way out. The buy button! The images you use on site are incredibly important. It’s no secret that beautiful imagery sells products. Customers like to see every detail in high-definition before they buy. It reduces risk, and increases desire! However, for a tip-top conversion rate, you can go one step further. Show your product in action. Here’s a GoPro camera in its natural environment. You don’t even need to see a picture of the camera itself, but you instantly want one! Asos do this even better by showing a catwalk of their clothes. It’s a much better way to see how their clothes fit than a couple of carefully edited images. It’s the oldest trick in the retail book, but it works like a charm. Sales inspire urgency, and give people an even bigger reason to click the ‘buy’ button. Obviously, you can’t run sales 24/7, but you can rotate which stock and items are on sale. Perhaps you could put all men’s clothes on sale for a week. Then all women’s clothes. Then just shoes. Keep rotating, and you’ll always have something on sale, sending your conversion rate sky high. Have you got two great headlines in mind, but don’t know which one is more effective? Or maybe you’re trying to choose between two different colours for your call-to-action. Rather than guessing or choosing blindly, run an A/B test to find out for certain which one works best. An A/B test serves up one option to half your visitors, and another option to the others. Whichever one converts best is your winner. And then you can implement that across the entire site. Start doing this with every major decision, and you’ll sharpen your conversion rate significantly. You’ll quickly realise that every small aspect of your site has an affect on your sales. You’ll want to test it all! Armed with these 16 mega-tips, you can increase your sales without spending a penny on extra marketing. Got any questions, ideas, or opinions? Please let me know in the comments, and I’ll be happy to answer.